Vice President Biden let slip that debt ceiling negotiators looking for budget cuts may "get well above a trillion dollars pretty quick." NEW YORK (CNNMoney) -- The search for budget savings is on. For the past couple weeks, Vice President Joe Biden and a bipartisan group of lawmakers have held a series of meetings. Their mission: Find money in the federal budget that can be cut and thus pave the way for Congress to raise the debt ceiling. The plan might produce caps on spending, cut farm subsidies and reduce benefits for federal workers. While lawmakers have been uncharacteristically silent on how negotiations are going, Biden let it slip that the group is looking to find cuts in the $1 trillion range. "We're in a position where we will be able to get well above a trillion dollars pretty quick," he told reporters. Most budget experts think the government needs to find savings of around $4 trillion over the next decade to get back on a sustainable path, but $1 trillion in cuts over the same time period would be a nice down payment. "I take them at their word they are looking at $1 trillion," said Marc Goldwein, policy director for Committee for a Responsible Federal Budget. "That would be an excellent start." And what exactly is on the chopping block? Details are thin, but clues can be found by comparing President Obama's budget plan with that of House Republicans, and other fiscal plans that have gained traction in Washington. The cuts are likely to come from areas where the plans overlap. One popular idea: Limiting discretionary spending through the establishment of a "cap" that would, at some point, force lawmakers to make hard choices on spending. Both Obama and Paul Ryan, the House budget chairman, favor a mechanism along those lines. Of course, Republicans and Democrats likely differ on the details, like which programs to cut and what level spending should be capped at. Depending on the final outline, CRFB estimates the 10-year savings from a cap could be as high as $1.6 trillion, or as low as $580 billion. That's by far the biggest source of savings. But there are about a dozen other proposals that would yield substantial savings. One option likely to make the final plan is asking federal workers to contribute more to their pension plans. That would save between $65 billion to $120 billion over ten years, according to CRFB. The federal government might also sell excess federal property, eliminate tax loopholes for oil companies, implement tort reform and auction spectrum licenses. In total, CRFB says the overlap among fiscal plans totals at least $1.1 trillion, which is pretty convenient for Biden and his group of negotiators. Congress is playing politics with the debt ceiling deadline. The House on Tuesday is holding a vote to raise the ceiling without making any cuts -- a measure lawmakers know will fail. On one of the most contentious issues, Biden insists that additional tax revenues must be part of any deal. Republicans remain steadfastly opposed to tax increases of any kind. And there isn't much time for futzing around. The debt ceiling deadline is quickly approaching. Treasury Secretary Tim Geithner said he'll only be able to buy lawmakers time until Aug. 2, at which point the country will not have enough money coming in to pay all its legal obligations in full. 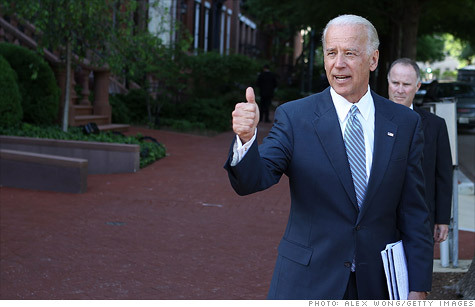 That limits the scope of reforms Biden's group will be able to negotiate. For example, experts say a wholesale change in the corporate tax code can't be worked out in such a short time period. And finding budget cuts everyone can agree on is tough. One needs to look no further than the negotiations over the fiscal year 2011 budget that almost shut down the government earlier this year. Despite the differences, both sides have called negotiations productive ... so far. "This can play a really important part in being the first step toward getting to the finish line," Goldwein said.